"What's not to love", the ad asks. 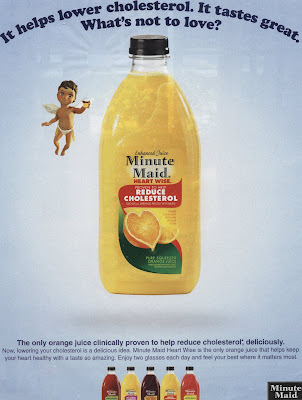 How about the 22lbs worth of OJ calories you'll have to drink per year to get the 12% reduction in LDL found in the Minute Maid funded study looking at this fortified OJ? No? Then how about the 76 cups of sugar you'd consume that year from the OJ. That's 38.5lbs of sugar by the way. You think maybe, just maybe, drinking 22lbs of OJ calories and 76 cup fulls of sugar per year might have some negative health outcomes? What's that? You're asking about those folks who already drink two glasses of OJ per day and that a straight swap's a good thing. Do you think maybe cutting out the 22lbs a year of juice and 76 cups of sugar altogether would be a better thing? What's that? You're asking about the person with the healthy weight who's drinking two glasses of juice per day? It'd be good for them right? Sure, 76 cups of sugar a year never hurt anybody, right?